If you read this blog you will probably have noticed that I love crafting and yet I also yearn for an organised, minimalistic home, two things that are a bit at odds with each other. Being a crafter involves gathering and storing a stash of different supplies, as you never know what might come in handy one day, especially if you flit between different crafts like I do. 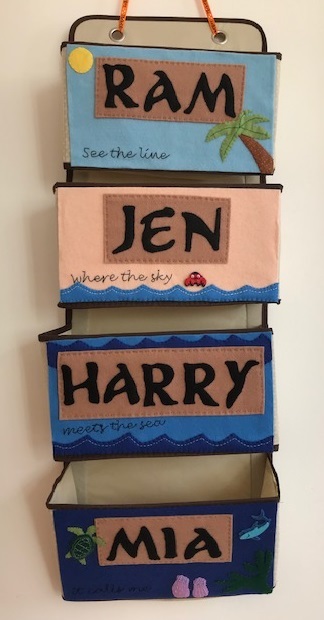 Then you are left with the dilemma of what to do with the finished product - there is only so much wall space in the home for cross stitch samplers and embroidery hoop art. So it's always good when I can find something to craft that is useful as well as being decorative, and I thought that today I'd share some of my crafty projects from around the home that help me to stay organised. First up is this week to view patterned wall calendar. I can't quite believe just how much this has helped me with day to day organisation. Every Sunday I open up our shared Google calendar and write down the things that we are up to that week. Some come around each week, like swimming and piano lessons, others are specific to that week. I can write on the glass with a dry erase pen and then easily rub it out the next week. It was so easy to make with just a picture frame and some patterned paper. Also in the kitchen, it's really useful to have a noticeboard where I can store the little bits of paper that accumulate in the house - letters from school, party invitations and so on. I shared how I made this padded fabric and ribbon pinboard using some lovely blue and white fabric with matching ribbon. It's really handy and looks lovely too! I love the little wooden Ikea drawers for storing small craft supplies, but they are quite plain to look at. I used some paint and patterned paper to upcycle the Ikea wooden drawers, and I was really pleased with how they turned out. They've help up well to plenty of opening and closing and they still look really smart. Finally, to keep myself organised I have lots of notebooks. Lots of my organising is done electronically, but nothing beats writing something down with a pen and paper, it just seems so much more solid! I used to decorate my notebooks back when I was at school, and the children and I recently used some Posca pens to decorate some black notebooks which was really effective. 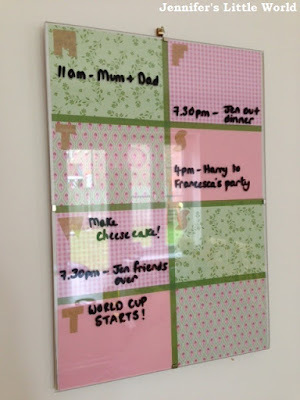 How do you keep yourself organised?